DRUTEX has always aimed at providing Clients with high quality products. In 1999 the company received international certificates ISO 9001 and ISO 14001 issued by TÜV Management Service GmbH from Munich, which confirms that the company has implemented and is applying the rules of management through quality and it complies with the norms of the environmental management system. Each year DRUTEX invests millions of PLN into modern production machines and equipment and into development of production lines. Apart from certificates, attestations and technical approvals issued by Polish and international certifying institutions, quality testing of PVC profiles as well as of the finished products also takes place in our own research laboratories that are equipped with modern machines for quality tests. The laboratories operate 24/7 which gives the company constant supervision over production processes and woodwork quality. device for testing resistance to static torsion. The company is equipped with one of the biggest test machines among Polish woodwork producers - KS Schulten with AWW chamber – which is used by renowned certifying institutions, such as IFT Rosenheim. Thanks to cutting-edge technology the company is able to test the functioning of its woodwork regarding profile tightness and resistance, running test for air permeability, water tightness and resistance to wind load. 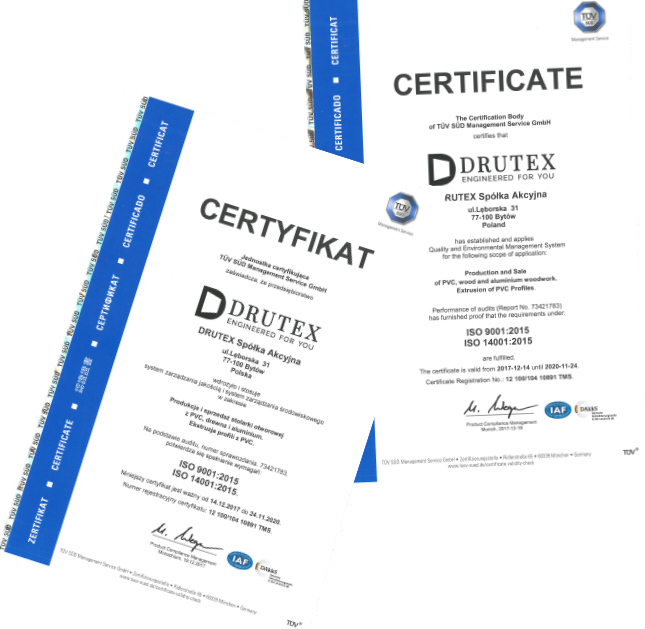 Constant production control and investment in technological advancement and the quality of components allow DRUTEX to perfect its woodwork and to give Clients tested and reliable products.